How to make posts in the blog homepage to be displayed with an automatic "read more" button and a thumbnail. To be more specific, this will show the title of the post, a short summary with a number of characters and a thumbnail, that will be the thumbnail of the first image uploaded inside the post. After the thumbnail and the post summary, there will be a "Read More" link which, when you click on it, will take you to the actual post. This Automatic Read More script will summarize content and the post summary will be shown only on the main blog page (homepage), category pages, and archive pages. Note: after hitting Enter, you'll find this code more than once but you need to stop at the third one. Note: if you don't see any changes after going through all the steps, please try to replace the second <data:post.body/> as well. - To change the number of characters shown when there is no thumbnail, modify the 490 value in blue. For the number of characters shown when a post has a thumbnail, modify the 400 value. - If you want larger thumbnails, modify the 160 (height) and 180 (width) values in red. Step 6. Click on the "Save template" button to save the changes. And this is how you can add auto read more with thumbnail to Blogger posts. Enjoy! There is 3 of " " in my template. Do I change all of these lines (to yours)? Hi there are 3 tags for in my code. Which one (or ones) do I need to change? I think you should replace them all. Word for me! Worked! Thank you very much!! Thank You Very Much Bro! I Used Your Technique And Its Working!! The Ctrl+F That You Suggest Was Most Helpful..
"Find (CTRL + F) and replace with:"
"Find (CTRL + F) and replace ALL the with:"
By The Way, Thanks Again! Hello! Thanks for all your help! I love your blog.. I have one question though.. I used the code and it works fine, but it only shows 1 line of the post in the preview.. Can I make it show more? 3-4? Hello admin! I tried this widget and thanks! It works! Whenever I enable google+ comments, I see some comment counts in my posts at the Posts section. But when I click it, I came to my blog and wala! No comments been made at all! Its been bugging me lately, and I fear it will get worse. How if the comments are about people asking questions and I'm not replying it cause I can't see any comments been made? I am scared of losing my viewers, as I had only started 1 month ago! Please teach me admin, any advice on this? thank you it really works for me but i want to increase number of words (intro statments ) how ca i do that plz? Yes please me too..waiting for your reply..
You can find it by searching for the <data:post.body/> tag and then look for the rest of it. Be careful when you delete this code - it should look exactly like the one above. I recommend you to make a backup of your template before changing anything. Thanks for visiting! Thank you so much for this! It works a treat! Hi, I've a small problem with your code for Auto Read More. How to do caption from a picture (zdroj ZDE) doesn't connect to a text of article in shorten version on the main page? Could you tell me how can I justify text above "Read more"? If you want more space between thumbnail and post summary, then change the 0px value from padding (first is the distance from the top, then right, bottom and left). Or, if you want to move the text, change the values for margin. I hope this will help you :) Thanks for visiting! can i delete the summary? I just want the title and thumb. If the post doesnt have images but videos, how can i add a thumb? I made the changes, but it does not seem to work. Can you please assist me with creating thumbnails and "read more" buttons for my posts on my homepage? nandiphotography.blogspot.com/ I am not sure where I have gone wrong.. I don't have the code in my html code??? Perfect, this works brilliantly for me thanks! 1. The thumbnail font is different to the blog post font - but I want it to be consistent with the post. How do I change this in the coding? 2. It includes all the social share buttons under each thumbnail, but I'd prefer these to be just in the actual blog post not on the homepage under each one. How do I change this? Click on the Save template button to save the changes. want some help the font page i did the coding is working for me but when i try to add a new page the coding is not working and the post is not becoming smalller plz if you can help right this in it? hi. can you please help me? I cant find the code in my template, though i find it using ctrl+f. There is no " " in my edit html code. Why so? I've used your html for the read more display and it worked a treat and i've hand it for a few months now, however i wondered if you knew i way to revert back to my old template as i didn't know you could save the old template? i tried it and it worked great. I have been searching blogs for this but no one seems to understand what they are posting, Godness, i have been on this for quite some days now. Thanks for your wonderful tutorial, and as from today onwards i'm a fan of your this blog. I have this question "How do i do it, I dont want the code to have effect on my thumbnail, because no matter what px you use the picture will still look horrible. Thats why i dont want the code to affect my thumbnail. hello when i enable the deception of the blog to activate search preferences the auto read more disappear what should i do pls. ??? Replace the last <data:post.body/> as well and see if it works. Thanks for visiting! Thanks, it worked great! Even works on the mobile template. Makes me wonder why blogspot doesn't offer this as a feature. Hmmm. Hi there, I installed this on my friends blog (jessaboutaverage.com) - and all was fine for about a month and it's suddenly stopped working. The thumbnail and small paragraph will not work any more and instead the full-sized pics and full post test are displayed. This change was sudden and nothing was done to make it happen. If I export the template and plug it into a new design, it works fine. It has been asked on the google/blogger help forum if this code doesn't work on custom domains? Can you confirm this? Is the code only for Blogspot.com addresses? (although admittedly it doesn't explain why it would work for a month and then stop). I know you must get a lot of comments but if you could let me know that would be great! Have you tried to replace the last <data:post.body/> with the script from step 3 to see if it works? Also, I need to know when you added the code because I've updated my post two months ago (see this reply) and it might be a little bit different from this one. If it still doesn't work (after replacing the last <data:post.body/>) you can send a copy of your template at helplogger76@gmail.com and I will make the modifications. Thanks for visiting! Thank your so much, I will try it as soon as I'm online properly. I definitely added the code after the second data: post-body, so will try what you've suggested. The only weird thing with my problem is that I can't replicate it. Anyway, I'll test it and let you know. Thank you very much!! I'm glad to hear that it was useful for you :) Thanks for visiting! This is fantastic! Thank you so much for posting this tutorial. I was hoping, is there a way to also hide the No Comments, share buttons and labels at the end of the post summaries (but they still show on the full length post)? its work for me, but only work with domain blogspot.com, i try to use it with custom domain .com, and the result isn't work. please tell me how fix this..
Tnk you so much. Saved a lot of time. How to increase the number of posts shown in Home page after adding this code. It is fixed 5 posts. i would like to increase the number of posts to greater than 5. 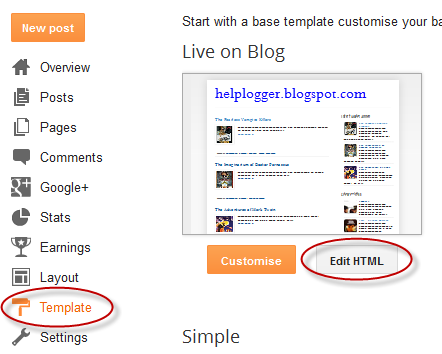 Even of i use the edit options in the blog to increase the number of posts it is not responsive & stays fixed at 5. Kindly help me. Please go to Settings > Posts and Comment and change the number of post on the right, where it says Show at most, then click on the Save settings button. I'm having the same issue as Eliza. The Home page is capped at 5 posts. If I change the "Show at most" less than 5, then the homepage reflects the setting. Anything over than 5, caps at 5 on the homepage. However, if I go to say, page 2 of the homepage, it will show the proper quantity of posts. Any thoughts? I have recently started to get my blog together that will be my photography blog. It comes with a nice addition that shows a thumbnail of the first image of a post, along with that post's title underneath. Click the title, and you're taken to the post, but click the picture, and it opens a light box. Look here: http://midnightstormnd.blogspot.com/ -- and then click on Gallery. I've tried changing the +img-src+ thing with 'data:post.url' and 'data:post.link', but it doesn't do what I want it to. Do you think you might be able to help, please? It's very frustrating, and honestly the last thing I want to do with the blog's coding before I move onto colors/graphics. I don't know from where you downloaded this template but you are using an older version of it... so I would recommend you to download the version 1.3 of the Queen template, which supports this function. You can find it on google by searching "Queen blogger template" (the one from lovelytemplates website works well). Sorry for the late reply! OMG! Thank you so much for this! I've been looking for a guide on how to do this. Thank you for making it so easy! I was just wondering, how can I make the font bigger in the post summary? I want it to take up the space between each post, especially since I made the picture bigger. Thank you again! Hii i have images which appear in thumbnail but for most of them the aspect ratio in thumbnail is not correct and images appear distorted, is there a way to maintain consistency? I am new to blogger from wordpress. Sad to say I like wordpress better for a few reasons. How can I add a feature photo without putting it in the blog post. An easy way to add a feature photo would be going to "Layout" and click on the "Add a gadget" link on the right side > scroll down and select the "Image" gadget. There you will need to add a title for your image and upload it by clicking on the Browse button. After you saved the photo, drag the Image gadget to where you want it to appear (blog posts area, sidebar, below the header etc.) and click on the "Save arrangement" button. If the picture size is too large, click on the "Edit" link within the Image gadget and check the "Shrink to fit" option. Please note that this image will appear on all the pages by default, but you can make it appear only on the homepage/post pages - here's a tutorial that will show you how to do it. Hey, thanks a lot for this, works great! I just had one question, how can I display the image above the summary text? I want the image to fill the main width of my blog post section so have adjusted the size but i want the text to display under neath rather than on the right. I hope this will work for you. Thanks for stopping by ! When i upload image from other website to my blog post, that image doesn't appear in thumbnail. But when i upload from my computer or from my own picasa account, it works fine. And also tell me how to show when i upload videos to blog that should be appear in thumnail. I hope it will look good now. Thanks for visiting! You have made my blog. It's really working fine.Thank you so much. please help me. my blog didn't work with Auto Read More and tried many many times but it still not. Thanks for the help! It made my blog look great. Didn't work the first time, but I realized I had to replace with the code rather than placing the code under the body tag. I used this and it worked on some of my posts, but some it didn't do anything. It is also saying read more twice. What am I doing wrong? I finally found out how to insert "Read more", thanks to your guide! But it seems there is a problem. It only works for the first post, the other posts below it don't have "Read more". Hi, thanks for you, it's work verry well ! But i have a question : i would like to apply a roll effect on the thumbnail which appared after. How i can add a roll effet ? And where ? I have read your post and comments. I have a problem hope you can help me. I want to hide part of my post but no make a summary. The summary change the structure of the post. You have to write words to avoid this at the first paragraph. So I want to know how to keep the post's structure without making paragraphs together. Or any other post will help me? Hi. My title is above my image and my summary is to the right of it. It looks okay, but I would like to bring the post title to the right of the image so it is just above the summary. Can you help me do this? It finally worked when i tried to replace the third . Thanks. OMG thank you so much!!!!!!!!!!!!! Thanks for this post! Unfortunately some of my images are not all the same aspect ratio, so the fixed width and height make some of my images look distorted. Is there a way to set the width and have the height automatically adjust, or vice versa? the code works perfectly thank you very much! Just one question: since my blog is in Italian (controarticolo.blogspot.it) I'd like the Read More link to display the words "Continua a leggere" instead of "Read More". Any help on this? Go to Template - Edit HTML, search (CTRL + F) for the "Read More" text and simply replace this text (the "& #187 ;" character is the arrow after this text, you can either leave it or remove it). I'm not sure why this is happening to you. Have you tried to modify the number of posts in Settings > Posts and comments and type the number in the "Show at most..." box? Also, please don't forget to click the "Save settings" button. Hi, very helpful post. But i wouldn't want the date to show on on post summaries, but it should rather show on the main page of the post. Any way for doing this with CSS or anyother? Thank you so much for this post, very very helpful! I was hoping - I don't want to strip HTML from the summary. How can I achieve that? I tried replacing the removeHtmlTag from the code but I just broke it. How can I add author name, label, number of comments to the below the snippet? Read more button is not appearing in all the posts except first one. What will be the reason please tell me. It seems that you implemented the code for the magazine layout, so you'll need to remove that one (replace the codes that you added with the older ones) in order to make this work. Thanks! It worked on my blog. I am actually looking to have the summary text and read more link appear under the title and ABOVE the thumbnail image. How do I do that? It works for all my older posts, but not the one I just posted, can anyone help? My blog http://vipreal.blogspot.com/ has worked already. Awesome! Tks much. does anyone know what to do, if your first picture is portrait? Because the values will squash the picture. Please help asap! Hi, great tutorial. is it possible to just post the title and the first image and then read more below it? Thank you so much for this post! Its working great on my sight. I was just wondering how to center the image and have while having the summary text below it. Right now the picture is to the left side. Also, I would love to have more than 5 thumnails showing on the page. I have gone to the settings tab and clicked to show "100" posts per page. But it has still not changed. Any help would be greatly appreciated:)! thank you very much, I'm trying. admin, it is working for me.but showing only two posts. i checked settings on post and comments and layout section. Thank you! This worked perfectly!!! Works like a charm!!! Thank you!